Everyday life is tough on our skin, Detox Facial Oil combines powerful botanicals that combat these aggressors on multiple levels. Omega-6 rich Evening Primrose promotes skin’s elasticity, improve dark circles and is a strong anti-inflammatory. Antioxidant and vitamin rich Jojoba Oil helps regulate oil production, clear out pores and provides a protective barrier under which skin can regenerate and normalize. Detox Facial Oil is formulated with gentle plant botanicals suitable for most skin types. Can I use Detox Facial Oil on oily skin? Absolutely. When we over-wash and/or do not thoroughly moisturize our skin, it reacts by overproducing oil and sebum that leads to clogged pores and oily skin. These plant oils hydrate skin without clogging pores so that skin can cease production of excess oil. 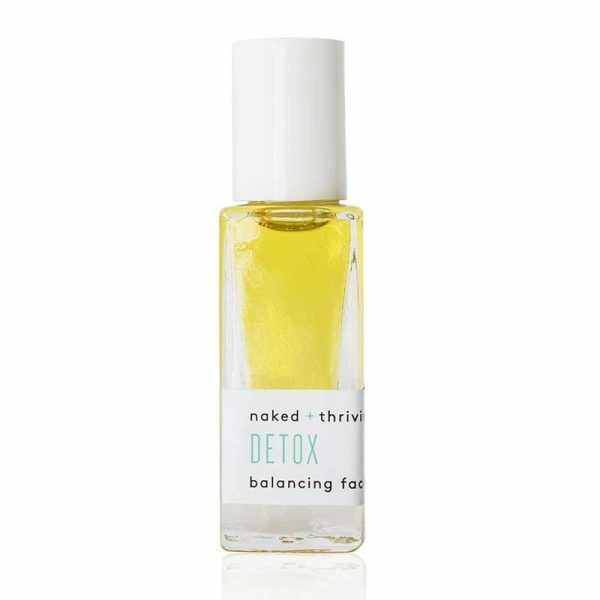 Detox Facial Oil may take longer to absorb into oilier skin than normal or dry skin. Jojoba Oil: Full of vitamins, minerals and antioxidants such as vitamin E and B-complex to help damage control and skin repair for healthy skin this organic face oil provides a protective layer under which the skin can regenerate and normalize. This unique “miracle” oil closely resembles sebum, a waxy substance produced by sweat glands, that helps regulate oil production, clear out pores & control acne while moisturizing skin. Jojoba naturally combats facial lines, skin scarring and fatty tissues while restoring skin to a balanced state and promoting the production of collagen. Evening Primrose: Rich with omega-6 fatty acids, which the body does not produce and can only be derived from plant oil, which promote skin elasticity. This powerful ingredient helps regulate hormone levels that relieve against skin’s daily stressors. Evening Primrose is also strong anti-inflammatory and helps reduce the appearance of dark circles under eyes. Frankincense: Hailed for its anti-inflammatory, astringent, antiseptic and disinfectant properties, Frankincense protects skin and reduces the appearance of large pores. This oil has been used for centuries to protect against aging and help promote tighter skin. Lemongrass Essential Oil: Known for healing properties, Lemongrass, is an antioxidant and astringent that serves as a natural toner, sterilizes pores and strengthens skin. Orange Essential Oil: High levels of Vitamin C protect and heal skin while powerful antioxidants, including limonene, fight free radical damage and inflammation. It also fights wrinkles and dark circles while slowing the rate of skin damage from UV light exposure pollution and toxicity. I only got the travel size to try it so I wouldn’t be out too much money if it didn’t work out! This oil is so awesome. My skin is glowing and is so soft and smooth! I will definitely be purchasing the full size bottle soon! Ashlyn - Feb. 28th, 2019 My skin tends to be on the oily side. I have been using Detox facial oil for about a month and I absolutely love it! It has actually calmed my oily skin...... I cannot wait to use the Prevent facial oil! I think I may be a forever customer! Combo/hormonal acne skin here! So far, it’s been great! I wake up to amazingly soft skin and it seems as if my skin just drinks it up! I have only used at night so far, but I may transition to mornings as well. I look forward to a cleansed face so I can put this oil on. Recently struggled with a bad breakout and nothing that I had used in the past was helping my skin heal. Come across this product through an internet search and have been using the detox oil morning and night and my skin is healed and has never looked better. Amazing results, will never go without this step in my skin care routine. I use the Detox and Rejuvenate oils, alternating them every other night. These oils are amazing! I am 37, fair skinned, and have sun damage on my face. I have acne prone combination skin with large pores. I have used a bunch of different products over the years to help combat the sun damage and reverse the premature signs of aging with very little success. I was hesitant to put oil on an already oily face, but my face is less oily after using these natural oils. I have alternated these 2 oils for just one month so far and have seen better results in 4 weeks than I have in years of using other products! I will be a life long user of these oils! I absolutely love them and highly recommend!! Key Ingredients: Squalane, Jojoba, Red Raspberry, & Coconut.